To recap, items 2 and 3 have little or nothing to do with nuclear power stations and most high-level waste was created before 1970 which has since cooled down to become transuranic waste. 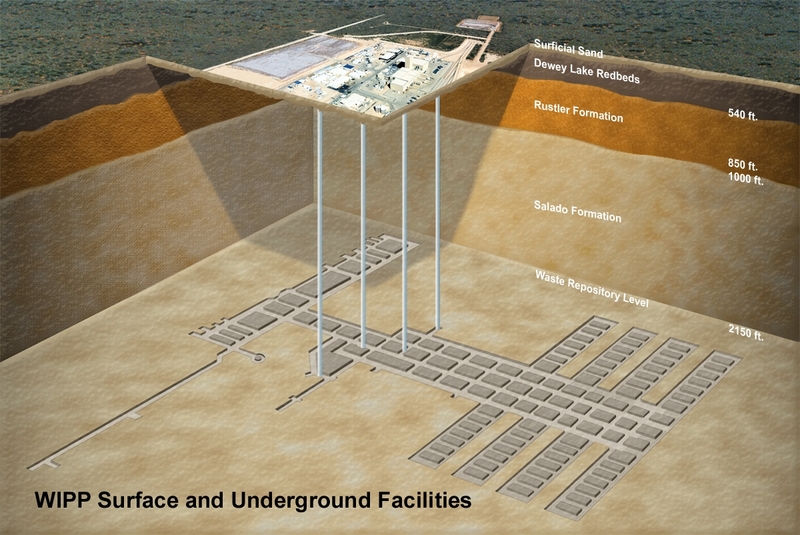 The United States actually already has a deep geologic repository called the Waste Isolation Pilot Plant (which needs renamed because it is no longer a pilot plant) that is now accepting waste. Many think it would be unwise to put used nuclear fuel into a repository you can’t retrieve it from because it could be a source of fuel for other types of reactors, like the BN-800 fast reactor that went into commercial operation in Russia last year. That reactor is being used in a “burner” fuel configuration to consume stockpiles of plutonium from decommissioned warheads but it could also be used as a “breeder” reactor. Breeder reactors could create enough fuel to power civilization for many centuries from used fuel. A much wiser idea for storage of our used nuclear fuel, which presently is sitting in parking lots at nuclear power stations in nearly impervious bomb shelters for fuel rods (commonly known as dry casks) would be to put all of these casks into a single secure parking lot just in case we need what is inside them to help save the world from climate change. These casks are good for about 160 years, so there’s no big hurry on that count. And the cost to build and run this secure parking lot could be paid for with just the interest on the money already put into the Nuclear Waste Fund by nuclear power stations. Thanks to anti-nuclear groups, the Department of Energy has paid roughly $4.5 billion in damages to various utilities for failing to create a permanent repository for used fuel with the money in that waste fund. The largely successful effort by antinuclear groups to prevent the creation of permanent storage may be what saves us in the end because it has kept that future supply of zero carbon energy available. Not sure which law that falls under, Murphy’s Law or the Law of Unintended Consequences. In addition, according to James Conca, this delaying action has made Yucca Mountain largely irrelevant. Most high-level waste has cooled enough to go into the existing Waste Isolation Pilot Plant and our used nuclear fuel really should be kept readily available for future use in an interim storage area. Please note that most of the above information was gleaned from articles by an expert on the subject, James Conca, writing for Forbes. Engineers love graphs but the general public, not accustomed to seeing them every day, tend to ignore them. There have been many attempts to convey without graphs how little waste is produced. In the documentary Pandora's Promise, they showed a football stadium that would contain all spent fuel used in the United States since the invention of nuclear energy. But to some people, this seems like a lot of waste. Images of Coke cans or a hand holding a vitrified glass disc of waste as examples of how much waste would be generated to provide an American with a lifetime of electricity fail because it requires the reader to trust whatever numbers were used to make this claim. Which is why I created the graphic below. No trust required. All you need are your eyes. And anyone is free to borrow this graphic to help reverse the decades of misinformation created by antinuclear energy groups. A common recycling bin helps put into perspective just how little waste that cask holds. Also note how small the nuclear waste cask is relative to the people standing next to it, and keep in mind that because that cask is very thick, it tends to greatly exaggerate the amount of waste inside. It never ceases to amaze me when antinuclear commenters use the cost of waste disposal as an argument against nuclear energy. The willful ignorance and lack of critical thinking would be gob-smacking if it weren't so ...ordinary. How could they never have bothered to Google the topic and read the Wikipedia article about the Nuclear Waste Policy Act? Nuclear power station operators have paid $25 billion into a fund for the government to provide central repositories. Who are the bad guys here? Answer; the antinuclear energy groups who have successfully lobbied our politicians to prevent the creation of a repository. If you think that the storage of dry casks at nuclear power stations is a sub-optimal idea, you can thank them for that. James Conca over at Forbes wrote an excellent article about a way to outflank the bad guys, which isn't to have one central repository, but to have lots of deep bore repositories in communities that actually want them and the income they would provide to the community. The antinuclear ideologues would have to go toe-to-toe with citizens who would stand to improve the quality of their lives. The deep borehole goes down so deep in the crust that the overlying rocks don’t matter. The water table doesn’t matter. The climate doesn’t matter. Human activities don’t matter. And it takes millions of years, if ever, for anything to get up to the surface from that depth in the Earth’s crust. At these depths, the pressures are quite high, exceeding 15,000 psi for target sites, so most pores are closed and many formation waters are not mobile. And the path lengths needed for travel of contaminants to the shallow crust, where they can enter aquifers and the environment, are incredibly long. 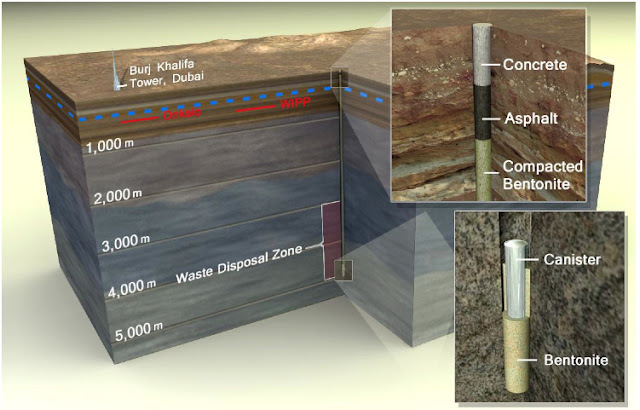 Since no single borehole can hold all the commercial nuclear waste we have, there would be many boreholes around the country, ideally some in every state that has nuclear power. One of the ah, more imaginative arguments in this category is that some future primitive civilization (an advanced civilization might actually seek them out for fuel) will find its way into one of these repositories. The odds of that happening is slim, to say the least, and the impact of doing so, not very big, especially when they realize this stuff has bad spirits and they rebury it. There's only one argument that brings the disingenuous more than the above, and that's the idea of shooting waste into space. God help us, individually, we're just not all that bright. Note that this essay was extensively edited on 1/29/2018 to add more information.